Unless you have suffered back problems prior to being pregnant, or during previous pregnancies, it is uncommon to have any in the early stages. In the mid to later stages, women develop an increase in their lumbar curvature as their centre of gravity changes with their increasing bump. The other curves of the back and neck also increase due to compensation, and this puts more pressure on some of the joints of the spine causing discomfort, and for some women pain. A hormone called relaxin is released during pregnancy which softens the muscles, ligaments and tendons in order to prepare for birth. As pregnancy progresses into the final stages the increasing size of your bump combined with looser ligaments make it easy to overstretch, or to find that lifting something is more of a problem than normal. Some chiropractors undertake postgraduate studies to obtain the necessary specialist training to enable them to work with women who are pregnant, and there are many adaptations that can be made to our treatment methods, and benches, to ensure the comfort of our pregnant patients. Evidence suggests it is very beneficial to both mother and baby if the pelvis and lower back functions biomechanically at its best during pregnancy, and especially during the birth. 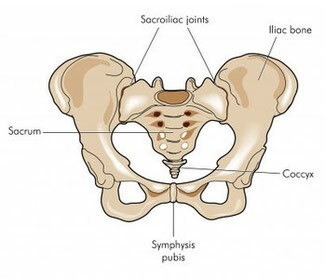 The three joints of the pelvis need to work and expand equally during pregnancy and birth to reduce the risk of overstretching, which can lead to postnatal pain in that joint. There are also some research articles that suggest chiropractic can reduce labour times, and the need for pain relief, due to decreased pressure on the back. Talk to your healthcare professional to discuss stretches and exercises that are suitable for you. The fitter you are, and the more muscle tone you have before pregnancy, the more likely you are to be able to cope with the body’s postural changes. When sleeping on your side putting a pillow between your legs/knees, or supporting your bump can help with lower back or pelvic pain. Core exercises are very useful and you can talk to a chiropractor, GP, midwife or other healthcare professional for advice on this. During pregnancy specialist yoga classes, taken from 12 weeks onwards, can be very beneficial. Swimming and aqua natal classes are also of benefit, as being in the water takes the pressure off strained joints whilst providing good exercise and relaxation. Avoid high heels and wear comfortable, supportive shoes. If you have children already, it can be difficult as they will need lifting and carrying. Always lift with your spine straight and bend knees to avoid leaning, stretching or bending. Do not sit for prolonged periods, take regular breaks and, when sitting, let the seat take your weight and, if possible, keep as much of your body in contact with the chair so that your whole body is supported. Knees should be lower than your hips. Try to keep stretching leg muscles to make sure unnecessary extra pressure is not put on the knees. Elevate legs whenever possible to offset any weight pressure and reduce any swelling - ankle circles will also help. Get measured for bras regularly throughout your pregnancy. This will help make sure you are wearing the right size and, therefore, getting the maximum support possible. Do neck and shoulder stretches regularly to relieve tension in the muscles. Even now I still have patients coming to me who have been told it is normal to experience these types of problems and that they will go away after the baby is born but as you can see that is not always the case. In a perfect world, it is ideal if you can be fit with good muscle tone before pregnancy without any back problems, but we are not always in that perfect world! However, It is never too late to start. Core exercises are very useful and you can talk to a chiropractor, GP, midwife or other healthcare professional for advice on this. During pregnancy specialist yoga classes, taken from 12 weeks onwards, can be very beneficial. 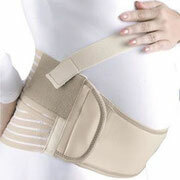 Long term use of these types of supports is not recommended, as one of the ways they work is to reduce the work the muscles have to do so weakening them and in the long run this can lessen the body's ability to support itself and recover. For further advice on the type of support that's best for you and when to use it talk to your chiropractor, midwife, or physiotherapist. Manual therapists can help patients with back and PPGP by mobilising and loosening tight ligaments and muscles, allowing stiff joints to move more freely thereby reducing pain. Each person's case is a little bit different, so treatment varies depending on what the patient needs, and more importantly, what is comfortable for them! Keep your knees together when getting in and out of the car, turning in bed, or getting out of the bath. If you are lying down, pulling your knees up as far as you can stops your pelvis from moving and makes it easier to part your legs. If you are sitting, try arching your back and sticking your chest out before parting or moving your legs. When sitting your hips should be above your knees. Birthing/exercise balls can help to reduce the pressure on the pelvis when sitting, but ensure it is high enough. If you are comfortable enough to do so, you can get down on your hands and knees to take the weight of your baby off your pelvis and back. Hold in a stable position for 10-15 seconds then slowly walk your hands towards your knees to help you upright. Do not do this if you find it painful getting in and out of this position as you risk making the problem worse.